Have you seen the great deals in the Banana Republic October 2018 Fall promo? 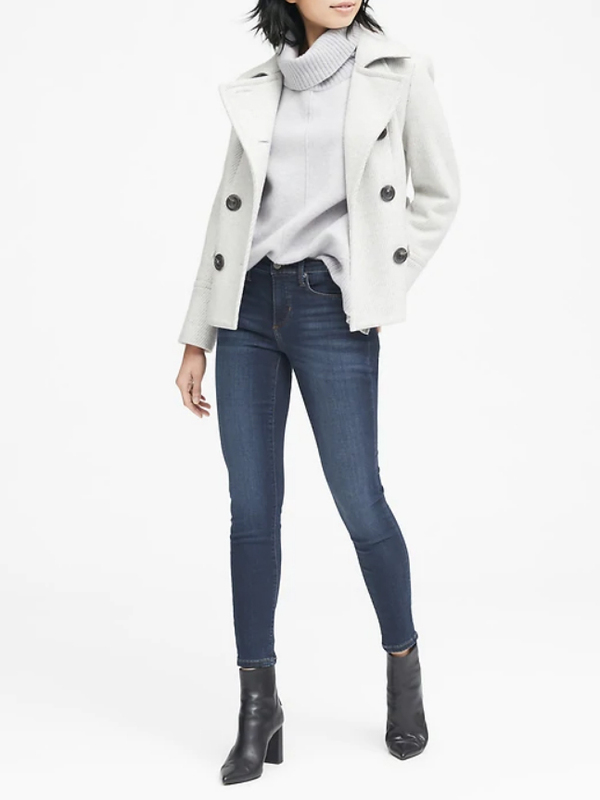 This post about the Banana Republic October 2018 Fall promo contains affiliate links. Please read this blog’s disclosure post for more info. Note: I know I promised a Free People post — it’s been pushed to Monday! Still on the way. 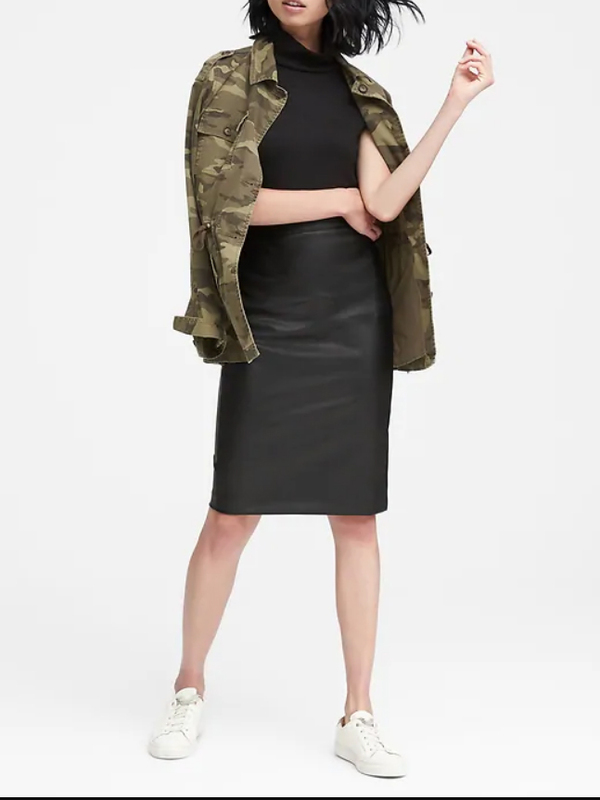 It’s no secret that I’ve been very happy with Banana Republic’s Fall lineup so far. And today might just be the day you give it a try too — the Banana Republic October 2018 Fall promo is on! You can save 40% off your purchase all weekend and today only (Saturday) you can take 50% off your Banana Republic purchase. The quality at Banana Republic has improved greatly for Fall. They’re also making a big effort to bring back classics customers want, like merino sweaters and washable workwear. Is there still work to be done? Absolutely, which is why I’m focusing mainly on items I’ve tried on or purchased in this post. This promo does have exclusions. On any product page excluded items will be noted right below the price. You can expect all leather and suede clothing to be excluded, many handbags and lots of dresses. Some of the items are worth it anyway at full price! All prices in this post are before the promotional discount is automatically applied at checkout. When January 2019 arrives I will be headed back to a conservative office environment from my current casual workplace. While I have a feeling that my team’s dress code will be moving more modern and fashion-forward under my leadership, at the outset it’s of course important to respect the guidelines currently in place. During the interview process last Spring and Summer I hadn’t found any good work dresses or suiting pieces at Banana Republic, so I’d kind of forgotten about them. But then in September I got a surprise callback with a company’s CEO and needed a dress immediately. No time to go back to Brooklyn from my Flatiron office! Over my lunch break I walked up 5th Ave. My first stop, J. Crew, was seriously lacking in any curve-friendly work options. (Fodder for another post.) Express, another handy work option for me, was also in full party mode with barely any work options at the time. In a pinch, I went into Banana Republic just in case. I’m so glad I did, because I found the Bi-Stretch Racer-Neck Sheath Dress (now $82-$128, above) in navy and it was perfect! The stretchiness was just what I needed and the navy color with just a bit of a slit kept the dress from riding up my hips. If you’re curvy like me with a larger chest I recommend sizing up — I’m usually a 10 in Banana Republic dresses these days and found a 12 perfect in this dress. Now, as I continue piecing together my new workwear wardrobe, Banana has come through big-time for me! I found a few more dresses perfect for work. The Trench Dress ($128, excluded) is a waist-friendly and on-trendy piece. The body-skimming Scalloped Bi-Stretch Sheath Dress ($128, excluded) has the right subtle details to keep me feeling empowered yet feminine at work. I’ve got more work dresses in the shoppable boutique at the end of this post. And workwear doesn’t have to be dresses only. 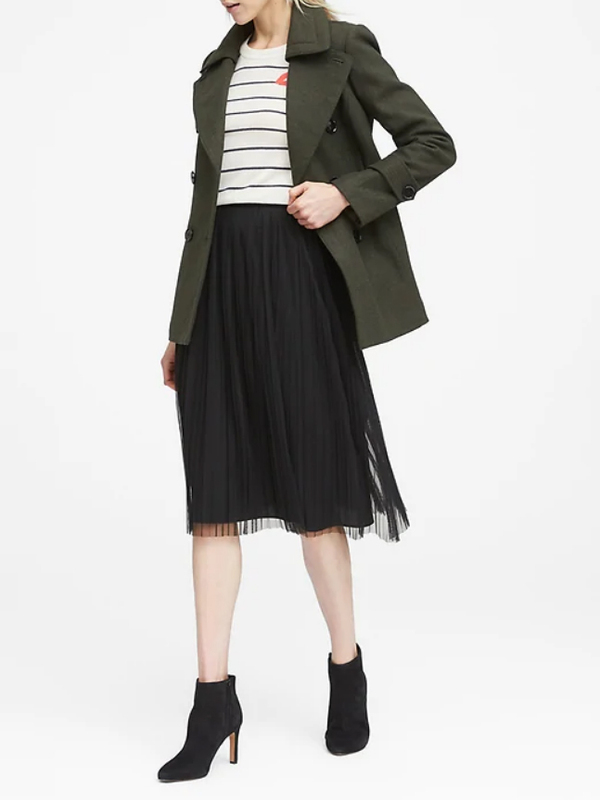 On a recent personal shopping excursion with a client, I was able to tantalize my tomboy-leaning client with the Pleated Tulle Midi Skirt ($118, above). We paired it with the Strappy Camisole (now $30-$50) in black and the Fitted Crop Machine-Washable Italian Wool Blend Blazer ($198) in black. The whole ensemble was perfect for her job as a TV producer! She’s since emailed me to tell me how many compliments she gets on the look. I also found some great new work pants, ones that I’d highly recommend to you during the Banana Republic October 2018 Fall promo! 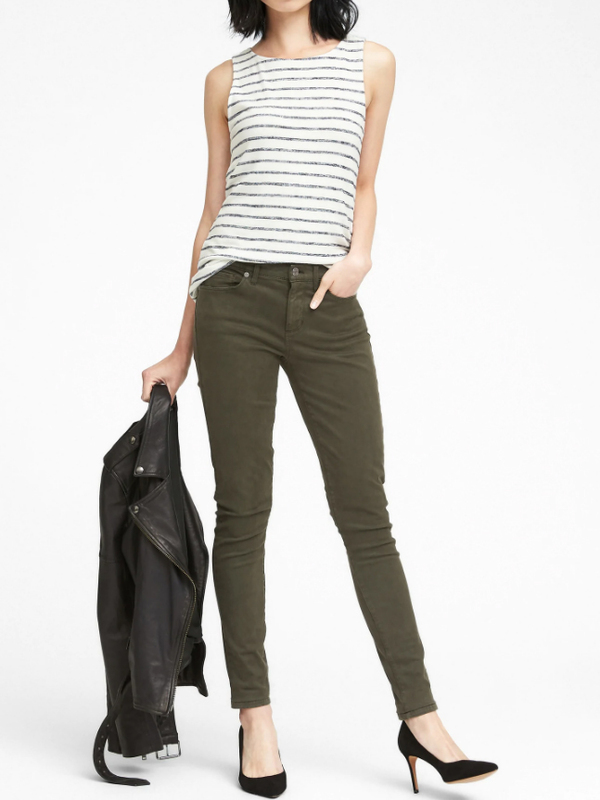 The new body diverse model shots are so helpful to me, enough so that I decided to order the Sloan Skinny-Fit Side-Stripe Ankle Pant ($88) during a previous promo. I find myself right between a 12 and a 10 in the pants so I stuck with a 12. The Sloans are generally very forgiving. Less so are the Devons, but after my good experience with the Sloans I decided to give the Devon Legging-Fit Side-Stripe Ankle Pant ($88) a try. These do loosen up over the course of the day but I found myself surely a 12 in these. If you’re thinner on your bottom half you are fine with your normal size, but curvy girls like me should size up. Many more work-ready pieces await in the shoppable boutique at the end of this post. Banana Republic probably wouldn’t be the first store I seek out to buy denim, but I do have a few pairs in my closet that have been surprising stalwarts! Years ago I needed a good pair of black skinnies, and the best pair I found to make my legs look great? Banana Republic’s Slim Straight Black Jean ($98)! Banana is decent about re-releasing items from year to year and I continue to recommend these jeans. Warning to my fellow talls: they are short. They look best with heels, but can also look very cute with the right pair of low-cut sneakers. 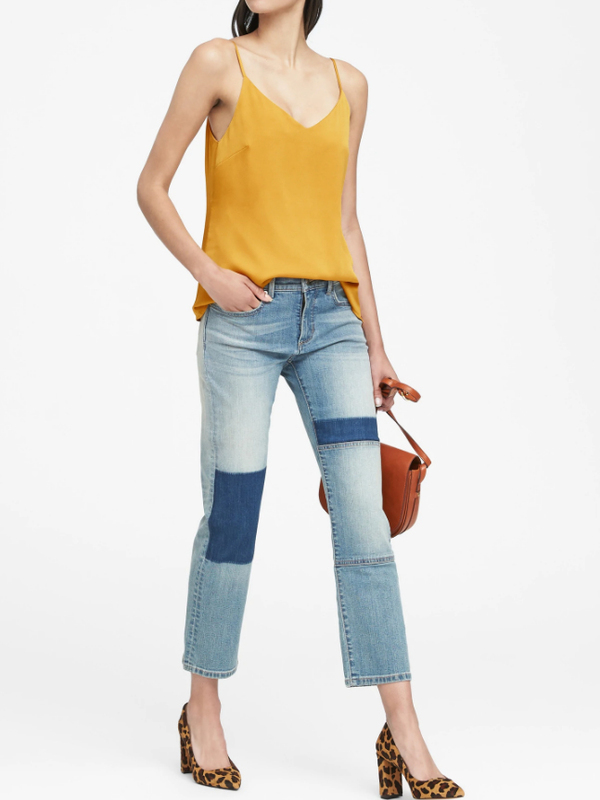 I also own and recommend the Skinny Stretch Cotton-Blend Sateen Jean ($98, above) which is one of the few pairs of midrise jeans I’ve purchased this year. They’re comfy with the right amount of hold. Nothing makes me happier than layering over my jeans. Banana Republic has come through for me there too! First of all, every woman needs a top like the Strappy Camisole (now $30-$50) in their closet. In the last two years camis had gotten very short and body-hugging which is punishing to anyone with curves. This cami is long (but not so long as to overwhelm petite bodies)! It’s not too tight! It looks great under everything!! The neckline is truly beautiful, a lovely wide view. See it on the model before the next section in gold. On the casual side, I like the Luxespun Twist-Front T-Shirt ($50) a lot for the same reason — it’s long! Most versions of this top would slide depressingly up my torso, but not this one. Who knew Banana Republic would be the store to nail this trend? Finally, Banana Republic has so many good cardigans this Fall. I can FINALLY replace my navy Banana Republic merino cardigan that got ruined at the dry cleaners with the new, washable version. 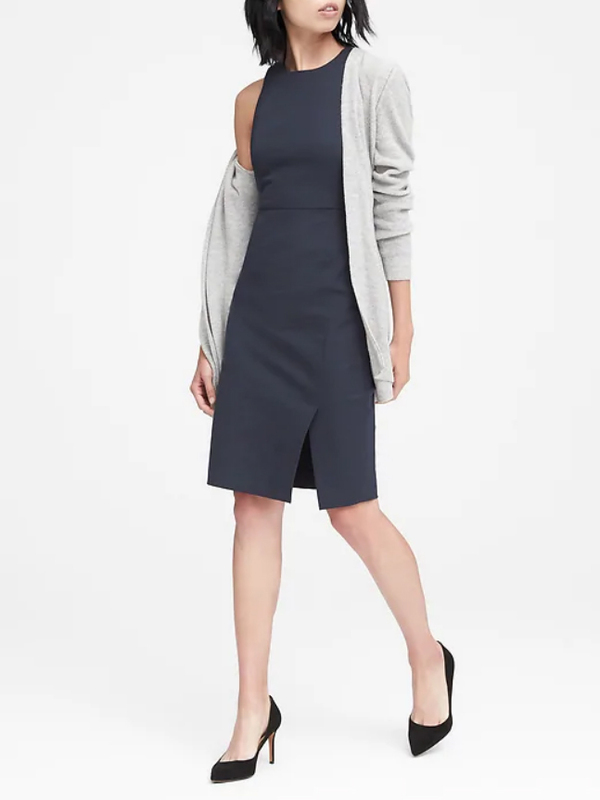 I’d also been looking for a new waterfall cardigan and found the ideal cardi in the Luxespun Ribbed Waterfall Cardigan ($68). I couldn’t decide between the lovely camel and black — so I got both! Between this year and the recent past, my closet has several items I love and recommend for you during the Banana Republic October 2018 Fall promo. Although it’s excluded, $118 is a very good price for the Vegan Leather Pencil Skirt (above) and it’s less likely to make it to sale. The Machine-Washable Italian Wool Blend Pencil Skirt with Side Slit ($98) is so good you guys — finally, pencil skirts are coming below the knee again! This particular plaid is modern and lovely and the skirt is incredibly flattering on! I have noticed a shoe trend recently where designs are placing heels so far back on shoes that they’re totally uncomfortable to wear — no arch support. Banana Republic has several great work heels. I find them comfortable for a whole workday. I’ve got lots of options in the shoppable boutique coming up in one more section. Tops on my Banana Republic wishlist right now? The Classic Suede Trench ($700, excluded). I’m going to wait before I spend that much on one item; instead I’ll order a bunch of stuff from my wishlist included in the shoppable boutique below! Here’s what’s good at Banana Republic right now. Next Post So much to love in the Free People Fall 2018 collection! I didn't find anything in the regular line that I really liked enough to purchase (well, maybe with the exception of the pink scallop sheath dress); however, I was drawn to some pieces from the Japan Collection, which feature some "old school" Banana Republic safari prints. I'm usually not a sweatshirt person; but for some reason I was really drawn to the green version with the giraffes on the back. The price was ridiculous for what it is so I used rewards. Fingers crossed it works out. Fingers crossed! Will you report back when it arrives Melodie? I'm also curious. Banana Republic extended the extra 10% off through today! …and today (Monday!) leather, cashmere and suede is now 20% off! No longer excluded, but not as deep of a discount as the rest of the promo.